ThrottleStop is one of the most useful programs for any PC user, but it can be intimidating to use at first glance. This primer walks readers through installing ThrottleStop, explains its basic features such as undervolting and temperature profiles, and guides them through some basic optimizations that any user could benefit from. 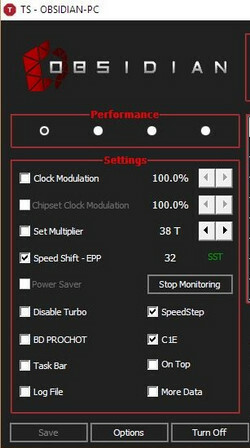 ThrottleStop, an original program by “UncleWebb”, started as a simple means to counteract some throttling mechanisms used in older laptops, check temperatures, and change CPU clock speeds. Over the years, ThrottleStop has been tirelessly updated by its creator and has now collected quite an array of extremely useful features not just for avoiding throttling and overheating, but for increasing the performance, battery life, and functionality. There is a “ThrottleStop Guide” thread on NotebookReview’s forum, but it is nearly 600 pages at the moment and growing by the day—it can be quite a challenge to find what you’re looking for in the thread. As ThrottleStop sees constant updates (this guide will use the latest version at time of writing, 8.48), this guide seeks to introduce users to the basic features of the latest version of the program and provide the most up-to-date information on its most common usage scenarios. There are an overwhelming number of settings which can be quite intimidating at first, but once you understand their basic functions and learn which settings are useful to you and which are not, it is relatively simple to use. There’s a solid case to be made that nearly anyone with a PC should use ThrottleStop—even if they aren’t a gamer, benchmarker, or other type of performance junkie. Even if your computer doesn’t throttle its performance (or more likely, you are simply not aware of it) or you don’t care if it does, ThrottleStop provides easy ways to decrease temperatures and increase battery life and performance. Lower temperatures and longer battery-life mean higher quality of life for both you and your laptops! Note: If you are already using Intel Extreme Tuning Utility (XTU) and you intend to use ThrottleStop, it is very important that you reset your XTU settings to default, uninstall XTU, then restart your PC before running ThrottleStop for the first time. XTU and ThrottleStop control many of the same registers and so do not play well together. If you start ThrottleStop with CPU registers from XTU set, it will read those settings as your defaults when they are not. You can always find the latest version of ThrottleStop in the first post in this thread on NotebookReview’s forum. There isn’t much to installing ThrottleStop. Simply unzip the archive into a folder (“ThrottleStop” would be a catchy name to use) in a location of your choice. Because you will be using Task Scheduler to launch the program on startup automatically, it’s best to pick a long-term location for it such as Program Files rather than the desktop. A recommended step once you have finished this guide is to set ThrottleStop to launch on startup using Task Scheduler. There is step-by-step guide for this here once you’re ready. Be sure to delay startup by 10 seconds to avoid problems with the Taskbar icons. Once you’re ready to begin, double-click “Throttlestop.exe”. You will see a standard disclaimer regarding melting your computer; read it and then click “OK”. After first opening ThrottleStop, you will be greeted by the main window of the program interface. It’s important to remember that all settings you see in ThrottleStop will be initially set to the default settings that your manufacturer has set for your CPU. 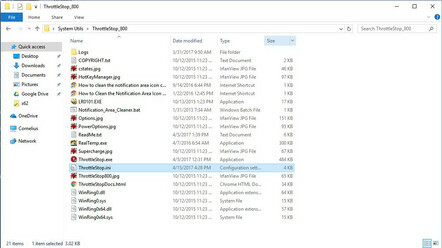 If you ever want to revert back to your original settings for troubleshooting or benchmarking purposes, simply go to your ThottleStop folder, locate the “ThrottleStop.ini” file and rename it or delete it, then shut down (not restart). This will clear any settings or registers set by the program. If you don’t have any reason to change a setting from its default, then leave it. Save - Saves the current settings to the .ini file. Options - Goes to the options menu for ThrottleStop. Turn On/Off - Before ThrottleStop will actually do anything, you will need to turn it on. Note that just because you click “Turn Off”, your CPU will not go back to its default behavior. To go back to its default behavior, you will need to exit ThrottleStop, delete ThrottleStop.ini, and fully shut down (not just restart) your computer. TS Bench - Opens a built-in benchmarking program. Though not strenuous, it is useful for detecting how recent tweaks you made will affect your CPU under load. In the top left area of the window, you will see four radio buttons. Each one has a customizable name (in the Options dialogue) and each refers to a separate settings profile for the program. A few settings are universal across all profiles, but most settings are profile-specific. We will discuss using more than one profile later. 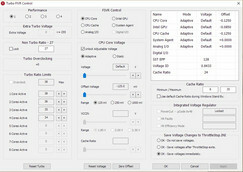 Clock Modulation/Chipset Clock Modulation - These settings were designed to counter an older method of throttling which told the CPU or chipset to run at a percentage capacity. For most newer chips, this method is not used, and enabling the feature in ThrottleStop will have no effect. Set Multiplier - Another somewhat obsolete setting; on older CPUs, the clock speed is determined by multiplying the bus speed of the CPU by a multiplier. For example, an old Pentium III-M with a bus-speed of 133MHz set to a multiplier of 10 would be operating at its full speed of 1.33GHz. On modern CPUs, the multipliers are set differently. With a Core i CPU, simply increasing the default value by 1 will tell the CPU to run at full turbo clocks. Setting it higher will have no effect, and setting it lower will be the same as not setting it. Speed Shift - EEP - Speed Shift is a great new function of Intel’s Skylake and Kaby Lake CPUs which supersedes Intel’s old “SpeedStep” technology. Where SpeedStep exercised software-level control over the CPU clocks, Speed Shift removes this inefficiency and lets the CPU dynamically change clocks without making calls to the OS. This means much faster upclocking and downclocking of the CPU. If you have a Skylake or Kaby Lake CPU, you want this enabled. Note: You will need to click on the “TPL” button and enable Speed Shift in that dialogue box as well. Though it should be enabled by default on new PCs, some companies, such as Dell, have decided not to enable to this feature on their XPS 9550 and 9560 notebooks. If you own either of those laptops, this is a feature that you definitely want to enable yourself. Next to Speed Shift is a box with a number value in it. The accepted values are 0-255, where 0 means absolute maximum performance, and 255 means minimum performance with minimum power drain. You can play around with this setting yourself and watch how the clocks change while performing a strenuous task. You should see that a value of 0 will keep clocks pinned at their maximum under most levels of load, 128 will allow some downclocking during load, and 255 will likely pin your clocks at their minimum frequency despite load. If you find your CPU is downclocking while playing games or other situations where you want maximum, consistent performance, try a lower value. This is where profiles come in handy (as we will discuss later), as you can use a value of 0 when plugged in and a more balanced 128 when on battery, for example. Power Saver - Power Saver is another legacy feature that isn’t necessary to use on modern CPUs. Only available when turbo boost is disabled, Power Saver will tell your CPU to reduce its clocks to minimum when idle. However, modern CPUs already park their CPU cores when idle to reduce power consumption, and the feature is redundant on anything newer than a Core 2 Duo. Disable Turbo - This option will disable the turbo boost ability of your CPU when checked. For example, an i7-7700HQ has a base clock of 2.8GHz but can turbo up to 3.8GHz for a single-core workload. If you check this box, the CPU will never attempt to boost above 2.8GHz. This is useful in some situations where limiting spikes in heat or power consumption are a priority or with profiles, i.e. making your CPU disable turbo once the CPU is above a certain temperature or on battery power. BD PROCHOT - Stands for Bi-directional Processor Hot. PROHOT is an emergency throttling system that is used when a CPU hits its maximum temperature (100 or 105C). BD PROCHOT is a system some laptops use where the CPU will be throttled when another component, such as a GPU, reaches a set temperature—even if the CPU is not hot to the point of throttling. Task Bar - Ticking this check box will prevent ThrottleStop from minimizing to the tray and instead will keep it in the Taskbar. Set this to your preference. Log File - This will create a timestamped text log in your ThrottleStop folder. This is useful when you record your clocks and temperatures by the second during a benchmark. Keep it off when not needed. Stop Monitoring - Clicking this will toggle the sensors and recording abilities of ThrottleStop. Speed Step - On chips not already governed by SpeedShift, this box should enable/disable the software-based up and downclocking of the CPU. C1E - Turning off this option should prevent the turbo boost from shutting down cores automatically. When off, clocks should stay near maximum and the CPU will use more power. Some users of real-time music processing software have claimed that disabling C1E helps with latency, but most users should leave it otherwise checked. On Top - This keeps the ThrottleStop window to draw on top of any other windows. More Data - Logs data at eight times per second instead of the default one time per second. Percentage of time the CPU thread is in its highest-performance state (C0). This should be lower when idle and higher when under load. Refers back to the “Clock Modulation” options, and should always read 100% on a modern CPU. Current temperature reading (C) of that CPU core. The higher peak temperature reached by that core. Can be cleared by clicking the “CLR” button below the readout. Package Power - An estimate of how much power your CPU is drawing as a whole. Temp - The current reading of the chip sensor (C). Note that this is often different than the individual core temperatures. Limit Reasons - The two boxes here, one radio and one tick, serve to notify the user if any throttling has occurred. If TDP Throttle’s radio box is filled, then that means the CPU has throttled due to Thermal Design Power (TDP) restrictions. If the PROCHOT 105C box is ticked, then the CPU has at some point hit its maximum safe operating temperature. Below this chart lie 5 buttons: FIVR, TPL, BCLK, C#, DTS, and CLR. Only three of them do anything significant, however, and we will be mostly only be concerning ourselves with two of them: FIVR and TPL. CLR will reset throttling and temperature records. Clicking DTS will simply change the temperature readings into degrees from the thermal limit rather than an absolute temperature (i.e. 25 DTS would mean 80C, 0 DTS would be 105C). C# will show the status of each of your CPUs threads. It looks confusing, but mostly it is useful for tracking down a rogue process that is hurting your battery life (your CPU should spend more than 90% of its time in C7 C State when idle). BLCK simply asks ThrottleStop to immediately recalculate the bus and clock speeds of your CPU on press. TPL is the Turbo Power Limit module, which is mostly useful for enabling Speed Shift on supported notebooks that don’t have it enabled in a BIOS update (i.e. the XPS 9550 and 9560). FIVR stands for Fully Integrated Voltage Regulator, and this is where we will soon go to undervolt our CPU. Before we go into tweaks, it’s important to set some options in the program first. You may wish to give each profile a name or number so it’s easier to keep track of them. I recommend setting at least one profile to AC and one for battery, as well as “Start Minimized” and “Minimize on Close”, as I always run TS in the tray on all my computers. If your computer has a dedicated GPU, check the box corresponding to your card (Nvidia or AMD). Once you’ve chosen your GPU (if any), close and re-launch ThrottleStop for the settings to take. 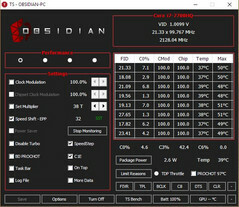 Now you should be able to see your GPU temperature displayed below your CPU temperature. The first thing we’ll do is reduce temperatures and power consumption while increasing performance by undervolting. Undervolting slightly reduces the voltage supplied to the CPU. The first thing people ask is “why doesn’t Intel do this by default?”, and the answer to that is that every chip is different: some can undervolt to -160mv, others only to -60mv. Silicon manufacturers like to give a bit of headroom just in case. There is no risk to undervolting (unlike overvolting), and the worst thing that can happen if you try to undervolt too much is that you will get freezes or BSODs (often under stress tests, but also at idle). To test an undervolt, run a benchmark. Sometimes it will crash immediately and you will know you have undervolted too much. Other times, an undervolt will work for benchmarks, but can lead to crashes on idle. If this happens, try reducing all your undervolts by 5mv at a time and see if the problem persists. Generally, too much of a CPU undervolt manifests itself in a freeze or BSOD, while too much of an Intel GPU undervolt will lead to a crash when running a graphics benchmark. Click the FIVR button to go to Turbo FIVR Control. You will see a lot options and sliders here, this process is actually very simple. Check to make sure you have the right profile selected (voltages can be profile-specific) then check the “Unlock Adjustable Voltage” box under “CPU Core Voltage”. There are 6 elements under “FIVR control”, but we only care about three: CPU Core, CPU Cache, and Intel GPU. In fact, CPU core and CPU cache should almost always be set to the same value. Make sure the radio button for “Adaptive” is selected, as well as CPU core, and now we can select an undervolt for it. Only adjust the Offset Voltage. How much you should undervolt depends a fair amount on what chipset you have. In general, Skylake quad-core mobile CPUs undervolt very well (between -125-165mv) while Kaby Lake quad-core CPUs don’t do so well (generally between -100-125mv). For this guide, I suggest a conservative undervolt of -80mv for your CPU Core. Once that is done, click “CPU Cache” and perform the same steps. CPU Core and CPU Cache should generally have the same undervolt. 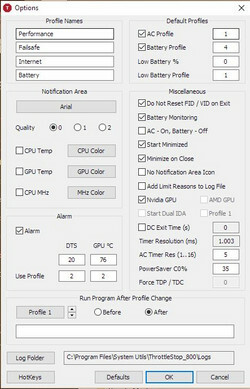 Lastly, select “Intel GPU” and give it a more conservative undervolt. The Intel GPU can generally be undervolted -50mv, but more than that is not guaranteed. Once you have done Core, Cache, and GPU, I recommend pressing “Apply”. If the voltages take and it doesn’t crash immediately, select “OK - Save voltages immediately”, as it is very annoying to re-enter all your voltages after a crash during testing. 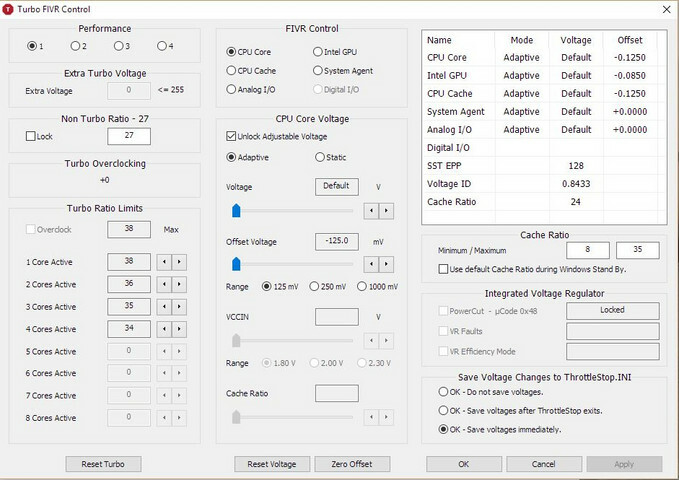 Before applying your undervolts to your other profiles, spend some time using your computer in various scenarios to make sure they’re stable. Once your undervolts have been set, it’s a good idea to set up at least two profiles (if you have a laptop). The first profile should be set in Options to be your AC profile. 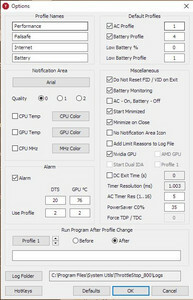 Check the box for “Battery Profile”, and select another profile to use on battery. This will cause ThrottleStop to automatically switch between the two profiles based on whether it is on battery. Your AC profile should probably be the highest performance one, because there are no considerations needed for battery life. I recommend setting your Speed Shift value to 64 or lower for maximum performance on this profile. Now click on the box in the main window for whichever profile you want to use while on battery. If battery life is a concern, I recommend checking the “disable turbo” box. Additionally, a more conservative Speed Shift value will help preserve battery life as well. Both 128 and 196 are values that are biased towards battery life. A third profile can be useful as a failsafe to cool off the laptop once a certain temperature has been hit. Go back to the “Options” dialogue box and you will see a section labeled “Alarm”. Rather than making a loud noise to wake you up, this feature will activate a profile of your choice while certain conditions are met. 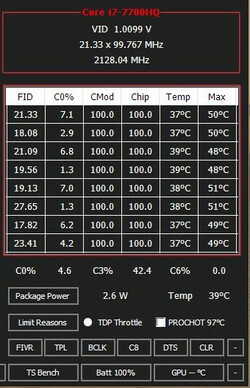 Remember that DTS refers to the number of degrees from max temperature, so a DTS of 1 means 100C on an i7-7700HQ. That is still quite hot, so I like to use a DTS of 20 (80C). Below that, you can enter which profile you want activated (select the number of your “failsafe” profile). Repeat the process for the GPU, noting that this box is measured in Celsius and not DTS. I prefer my GPU temperature to stay below 78C. Click “OK” and navigate to your failsafe profile. This profile is designed to give your CPU a bit of breathing room if temperatures get too hot for your liking, so you probably want to check “Disable Turbo” as well as perhaps increase your Speed Shift EPP value to 128. Now, when your CPU or GPU hit your desired temperature limit, ThrottleStop should automatically switch to the designated profile until the temperatures drop. Once they drop below the threshold, it will automatically return to your default profile. This method of keeping temperatures in check is often preferable to letting the laptop manage its CPU and temperatures according to the manufacturer’s settings, as this allows you to effectively set your own customized temperature ceiling. This concludes our primer on using ThrottleStop. Some descriptions and functions have been left out because they were mostly self-explanatory or beyond the scope of this basic set-up. Once you get past the initial intimidation factor of technical terms, I hope you find that using this program to tweak your notebook for power consumption, performance, and heat beneficial and straightforward.